I always love these “Ticking Time Bomb” posts, Rodger – keep reminding people every so often. Thanks. Do you think that one day the American people will see that they are being conned? Based on what I’ve experienced with people and their long-held beliefs… no. But keep fighting the good fight. Speaking of stupidity, Trump just told his followers that when people shop for groceries, they need a picture ID. This is the first time I realized that the picture on a dollar bill was of ME! His followers cheered. Were they cheering for me? By the way, if you haven’t seen it yet, check out the article on new economic perspectives.org entitled, “The Explicable Mystery of the National Debt”. Idioitic ramblings. Countries that have tried this experiment experienced hyper inflation / currency devaluation. Did you even read the post? It addressed that very issue. By “countries that have tried this experiment,” do you mean the United States, which has experienced a more than 40,000% debt increase since 1940? Where is the hyper-inflation? Where is the currency devaluation? Or, after 80 years, are you still predicting that the “ticking time bomb” will explode at some unknown time in the future? 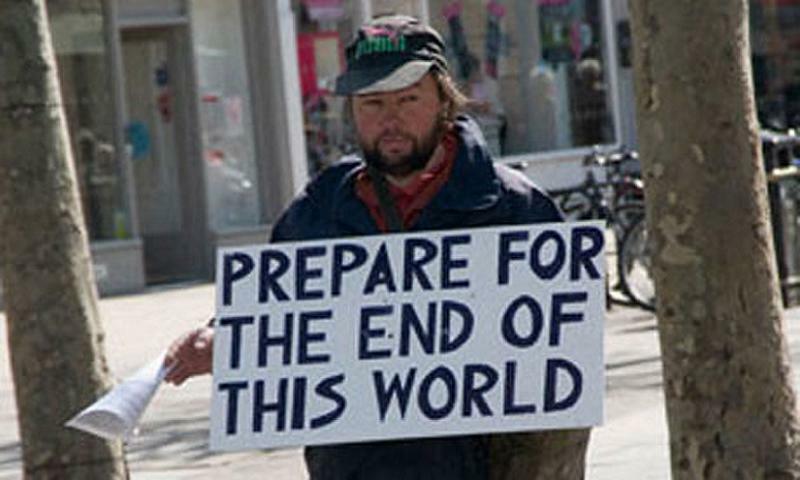 Are you that guy in the photo, holding the sign that says, “Prepare for the end of this world”? 1. Why has the United States, in its 242 year history, never had a hyper-inflation? 2. Hyper-inflations are not caused by federal money creation. They always are caused by shortages, most often shortages of food.